This is a set of 9 cards which can be used to revise basics grammar and vocabulary problems e.g. 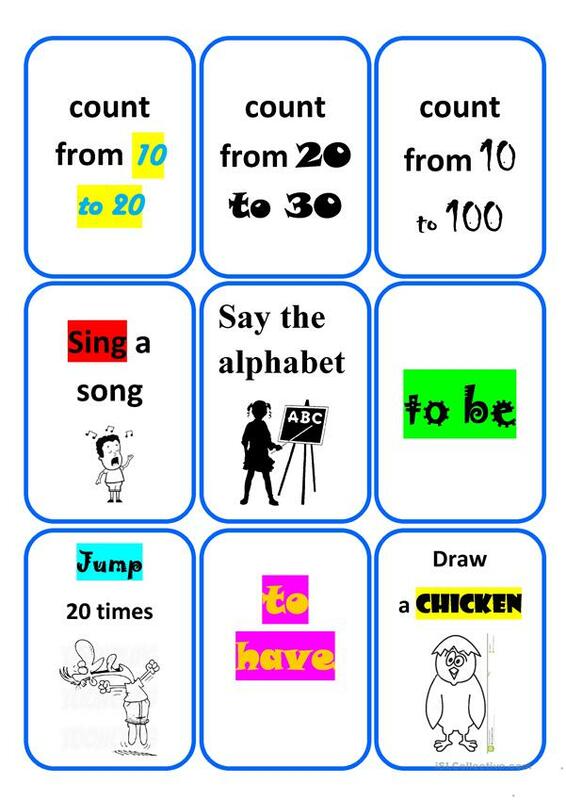 to be, can, have got, there is, prepositions of place, adjectives verbs and more. Children have to do the tasks given in the cards. Some of the tasks are funny e.g. Hang a spoon off your nose. I want to thank my daughter for helping me with a visual aspect of these cards! This downloadable printable is recommended for elementary school students at Elementary (A1) level. It is useful for strengthening your learners' Speaking skills. dobrawaa is from/lives in Poland and has been a member of iSLCollective since 2009-12-10 06:11:14. dobrawaa last logged in on 2019-04-19 21:33:30, and has shared 65 resources on iSLCollective so far.